Labor Day is nearing; the unofficial end of summer across Tennessee. If you’re among the many Americans planning an end-of-season barbecue, you’ll want to make sure your grill is clean. There are several ways to clean a grill but, for owners of gas grills, the first step always is to disconnect the gas source. Next, open your grill and remove its metal pieces. This includes grates, trays and flame guards. Take these pieces to your kitchen. If the oven has a self-cleaning mechanism, place the items in your oven and let it “self-clean”. As the temperature reaches 900 degrees or more, residue will literally fall off your grill parts. Be sure to wipe clean your oven once the cycle completes. If your oven is not self-cleaning, wash the grill parts in your sink using hot water and detergent. You’ll want to soak the parts in soapy water if they’re especially dirty. Once clean, allow the parts to air dry. Then, return to your grill and using a wire brush, scrape the residue from the sides, top and bottom of the appliance. Again, using a soapy hot water mixture, wash and wipe down the inside of the grill. Rinse it clean once the residue is removed. Lastly, reconnect the gas source (if applicable) and allow the grill to burn for 5 minutes. This will burn off any lingering residue from the cleaning process, including soap and detergent. 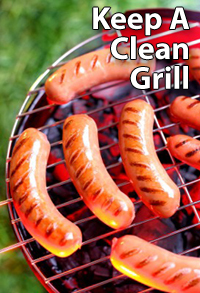 Plan on cleaning your grill at least twice annually with heavy use.